Graduates from SUNY Maritime College receive among the highest return on investment on their degrees in the country. In its annual report of best value colleges, PayScale ranked SUNY Maritime College as the top public institution for return on investment and third nationally, tied with Harvey Mudd College and following California Institute of Technology and Massachusetts Institute of Technology. The college also came in first among public institutions and fifth nationally according to a similar ranking by CNN Money, after MIT, Cal Tech, Harvey Mudd and Stanford University. Both rankings use similar data including graduates’ earnings compared to those without college degrees, time to graduation, average student debt and grant packages, and cost of the degree. These rankings are in addition to a PayScale report from last summer that found SUNY Maritime’s graduates have the highest median salaries of all colleges in the country. 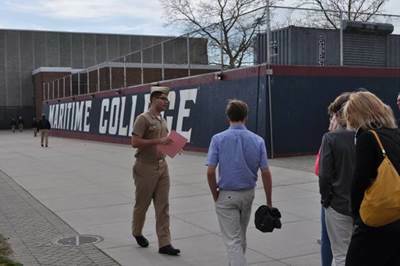 SUNY Maritime has also been on The Princeton Review’s list of Best Colleges in the Northeast for nine years in a row.